If The Beatles and Weezer got together and had a baby, and that baby joined the drama club, that baby would grow up to be Bombadil. Consisting of multi-instrumentalists Daniel Michalak, Bryan Rahija, Stuart Robinson and James Phillips, Bombadil borrows its name from J.R.R. Tolkein’s character, Tom Bombadil, who is equally as enchanting as the Durham-based quartet. Having just released their self-produced, fourth LP, “Metrics of Affection,” Bombadil proves that authenticity mixed with a dash of merriment and a handful of emotion equals the perfect musical recipe. Last month, the touring members of Bombadil graced the Tipsy Teapot stage in their idiosyncratic band regalia — collared shirts, ties, and accessorized sports coats — and treated a modest but attentive audience to many of the tracks off of their new album. While the live versions of these songs offered a quirky visual to match the lyrics, the intricacies are best revealed and reveled on the studio version. Sitting down with the liner notes, reading the lyrics and allowing the songs to tell their stories truly takes the listener on a journey through the land of Bombadil. On “Metrics of Affection,” Bombadil stands proudly at the helm of their ship and assumes complete creative control. With production in-house, the band was able to push the boundaries and experiment more than on any previous albums, resulting in a rich but not overproduced collection of songs. While vocals and traditional instrumentation — piano especially — remain at the forefront of each track, thoughtful use of samples, synths and drum machines advances the overall sound without stripping its playfulness and originality. Throughout the album, vocals and keys emerge in the spotlight, as hints of acoustic guitar round out the sound. Melodic and often flirty piano accompaniments, paired with witty, relatable lyrics about love, loss, whales and cats certainly draw listeners in for a deeper auditory experience. The album opener, “Angeline,” offers a catchy beat and lyrics of friendly advice to move on from the past, all made sweeter by the charming harmonies of Christy Jean Smith. “Learning to Let Go” is the album’s clap-stomp sing-a-long track, accompanied by faint horns that lend an imperial air. The ever-popular banjo makes its first appearance on “Born at 5:00,” though it is not what makes this song one of the album standouts. Here, Bombadil succeeds in packing all of the milestones of one man’s life into a 3:11 minute song — a bold and touching reminder of the fleeting nature of of our time on Earth. “Isn’t It Funny” features a militant drum line underlying Michalak’s first attempt at rapping. With an Eminem-esque cadence, Michalak’s passion surfaces while recounting an illness that almost ended his music career. The men of Bombadil lay their emotions out for the world to hear on heartfelt ballads like “Boring Country Song” and “Have Me,” and heart-breakers like “What Does It Mean” and “One More Ring.” This sentimental roller coaster ride of love and loss is capped off by “Patience is Expensive,” a hauntingly beautiful piano instrumental that oscillates somewhere between hope and despair. Quirkiness sets in with “When We Are Both Cats,” which speaks of unrequited love and feline reincarnation — not the typical love song, folks. The animal theme continues on the old-timey, maritime track, “Whaling Vessel,” where Bombadil sings from the point of view of a hunted whale. While these song themes may seem off-putting to some, their unique nature translates magically, further lifting the album’s spirit. Propelled by a rolling piano melody, the album closer, “Thank you,” is the perfect note on which to end this baker’s dozen of goodness. With lyrics like, “Keep your family close/Because when you get in trouble/They’ll be the last to lose their hope/And say your prayers every night/They don’t have to be to God/It just helps to sort your thoughts/And you never know they might be right,” listeners are called on to be grateful and gracious for all of the small, but meaningful moments in life. Bombadil’s most recent installation combines all that is currently overdone in folk-pop — stomp, claps, banjo, cellos, unidentifiable accents — and somehow makes it feel renewed. Perhaps it is the persistent piano or the eccentric storytelling. Regardless, “Metrics of Affection” is a triumphant composition that covers the emotional spectrum of life and love, beginning with a journey and ending with gratitude. 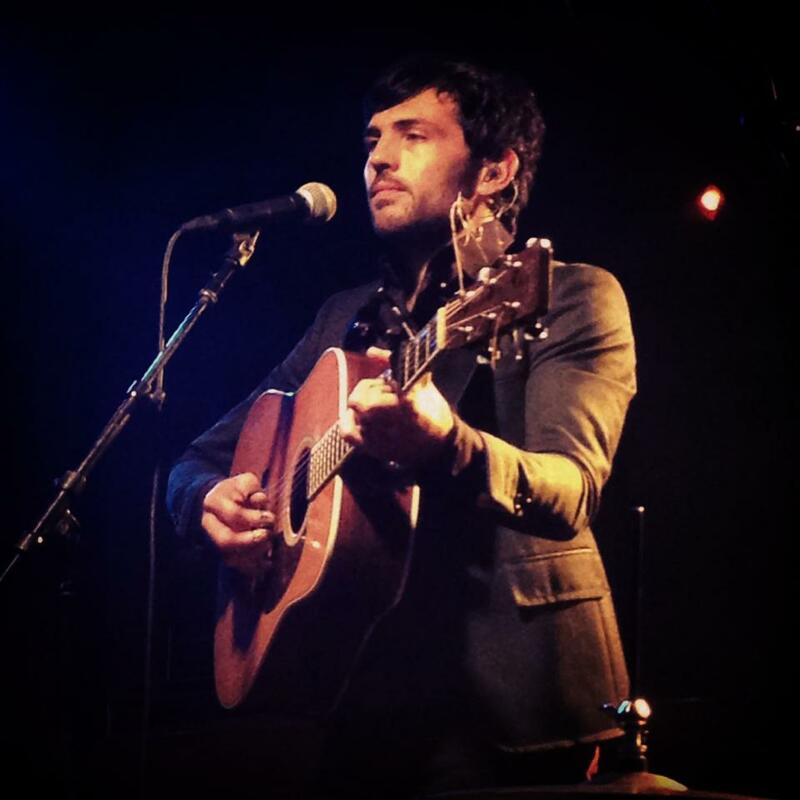 Scott Avett sang, “I will rearrange my plans and change for you,” during the song “If It’s the Beaches” on Wednesday night, at the McKittrick Hotel in New York City. However, I was the one who found myself changing my plans on September 25, 2013 in order to attend a private Avett Brothers concert in The Heath room of the fictional hotel and home of the off-Broadway play, Sleep No More. The band played an eighteen-song set that was taped for the PBS program, Front and Center. The concert is to be aired in early 2014 in support of their upcoming album, Magpie and the Dandelion, being released on October 15th. After reading a tweet from The McKittrick Hotel, a routine weekday morning at work quickly ended when I made the decision to board a train to New York City. The hotel was giving away a handful of tickets to Avett Brothers’ fans for a secret event at 8:00pm. The details were minimal, but I had made it to Penn Station and I was determined to win. Constant refreshing of my twitter news feed and a mild addiction to social media paid off–I was in. At the entrance doors of a warehouse in Chelsea, a host read my name on the guest list and invited me in. I was escorted to a dark and eerie elevator and taken to the fifth floor where the show was to be held. The home of the play, Sleep No More, is a 100,000 square foot building that is modeled to look like a 1930’s hotel, known as The McKittrick Hotel. This special occasion was a rarity for the band, as well as for the hotel. While a show is held at the hotel every night, this concert was much different than what usually happens at Sleep No More. Typically, guests are given white masks and instructed not to speak. They wander the rooms of the haunted hotel and follow actors. Guests experience the play, based on the story Macbeth, in a much different way. They are told, “Fortune favors the bold,” and are encouraged to stand out from the crowd or they just may be taken into a hidden room or given privy information. Those who have seen the play, return again and again because it’s a different experience every time. The Heath room, was decorated like a haunted hotel bar–dark, cozy, and a little bit spooky. The walls of the small room were lined with booths and the floor was full of tables set for two. Drinks were being poured at the bar and large HD television cameras were resting on their tripods. The stage sat crowded with instruments as guests made their way to their seats. A Sleep No More mask lay at the foot of the drum kit. The room held 200 people, but it was not full. I took my seat in the front row, ordered a drink, and admired the elegant décor while I waited for the show to begin. The band took the stage at 9:00pm. As he plugged in his Martin D35 guitar, Seth Avett whispered into the microphone, “It’s so quiet,” and let out a laugh. They thanked the audience for attending and kicked off the set with the song “Live and Die,” from their 2012 album, The Carpenter. As I sat in my chair, I fought the urge to get up and dance. I assumed the PBS cameraman behind me would not want me blocking his shot. The band played crowd favorites, such as “Murder and the City,” “I and Love and You,” and “Laundry Room.” Among the set were also new songs, “Another is Waiting,” “Vanity,” “Morning Song,” and “Apart from Me,” all to be featured on the new album. Having attended several Avett Brothers concerts, I had been waiting to hear “Morning Song” performed live. Although I have not listened to the new album in its entirety, I can already tell this song will be a favorite of mine. The show was intimate and unlike any other I’ve seen. The band told stories and joked with one another throughout the set. Between songs, Scott reminisced about visiting New York City for the first time at age 26. He said he was intimidated by the fast paced city life, but has since grown a love for the city, and was happy to be back. “This is very exciting for us, to be playing a place like this,” he confessed to the audience. The band had created a setlist prior to taking the stage, but changed a number of songs on it to better suit the mood of the room. Scott and Seth would have short debates on what to play next in between many of the songs. The final song of the encore was “If It’s the Beaches.” A passionate love song, played quietly to a room of attentive ears. The audience rose to their feet and applauded the band whole-heartedly, exchanging ear to ear smiles with the band. It had been a special experience for all of us. I joked with a friend, telling her my face hurt because of the permanent grin I had worn for two straight hours. In groups of ten, we boarded the elevator and made our way to the exit. Once outside, we saw the band hustle into a van to be whisked away. Fortune favors the bold and fortune certainly favored me when I made the bold move to leave work early on a Wednesday morning. I’m thankful for this experience and look forward to reliving it through the PBS broadcast of Front and Center early next year. The Avett Brothers will stay in New York for the next few days. 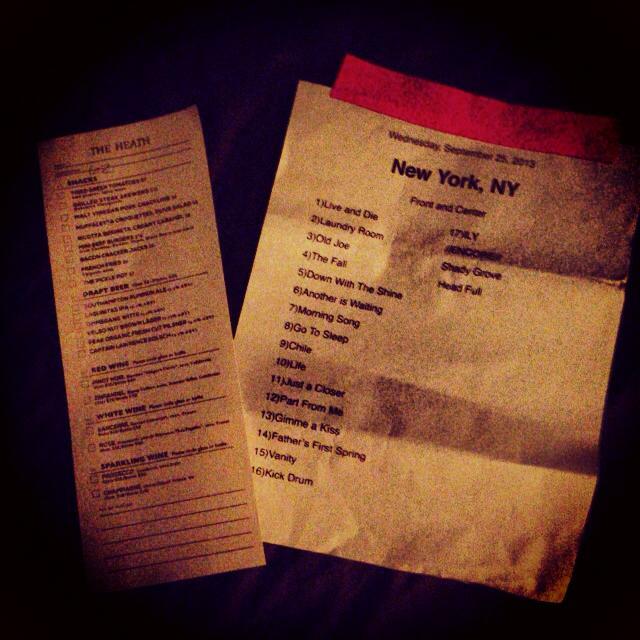 They are scheduled to appear at New York’s Town Hall for Another Day, Another Time on Sunday, September 29th. 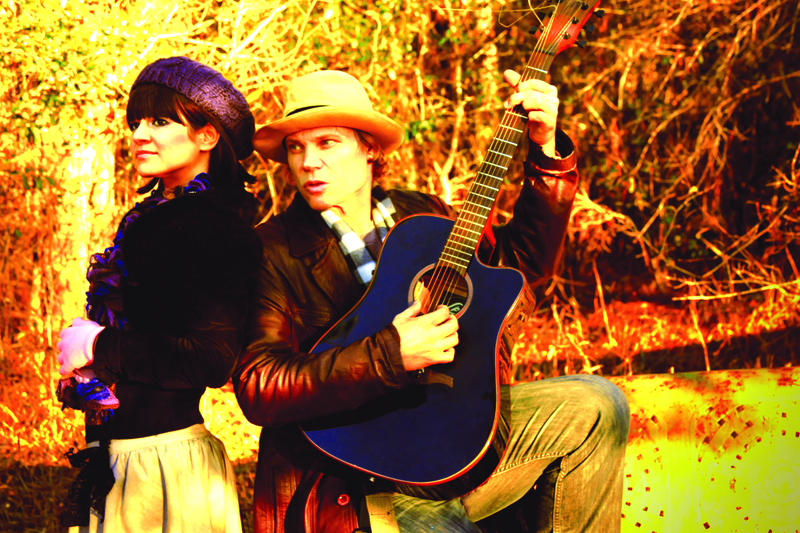 This concert event is celebrating folk music of the 1960s. Several other musicians will be joining, such as Jack White, Marcus Mumford, Joan Baez, Punch Brothers, Collin Meloy, Milk Carton Kids, Patti Smith, Conor Oberst, and more. On Monday, September 30th, The Avett Brothers will return to Late Night with Jimmy Fallon for a television performance on NBC. For the first time in Evolution of a Fan history, we welcome our first guest blogger, Karissa Sevensky. 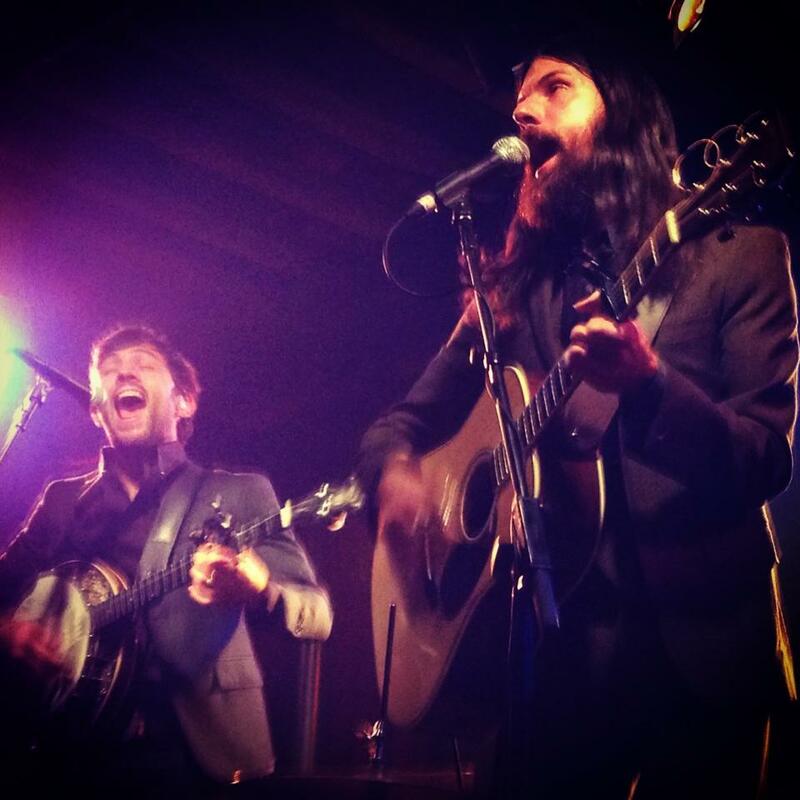 Karissa was fortunate enough to share a very special evening with The Avett Brothers at McKittrick Hotel this past week, and kind enough to share her experience and photos with us! Thank you Karissa. These lyrics resonate with me each time I listen to The Avett Brothers’ new album, The Carpenter. While there are certainly collections of lyrical lessons nestled in all twelve of the album’s new songs, these particular lyrics from I Never Knew You serve as a shot of reality to fans, both old and new. The band, made up of brothers Scott and Seth Avett, bassist Bob Crawford, and touring members cellist Joseph Kwon and drummer Jacob Edwards, is sending a pretty clear message that they are a forward-moving, well-oiled, meticulously crafted machine that shows no sign of pumping the breaks anytime soon–not even for their fans who are waiting at the “I Want More Banjo Station” screaming, “Hey, what about us! ?” Didn’t Ill With Want teach you all anything? Sure, The Carpenter has a more produced sound (um, it’s a studio album), and yes it may teeter on the cusp of mainstream pop music with an Americana twist, but so what!? Music is made to move the listener, to evoke emotion and thought, and that is what The Avett Brothers do best–banjo or no banjo. If the album moves you to tears, laughter, love, goosebumps, or overwhelming joy, well then stay on board and enjoy the ride. If you start to experience motion sickness, please feel free to get off at the next stop and find a different destination, because this Avett train is movin’ on. For me, listening to The Carpenter is kind of like taking that train ride through the countryside–a thought-provoking experience of varying landscapes for the senses and soul. The brothers Avett, a charming pair of musical vagabonds who never seem quite comfortable sitting still, take listeners on a journey down the path of self-discovery. While they have left deep, muddy bootprints in all corners of the US, their mode of exploration goes well beyond planes, trains, and automobiles, so much so that they spent nearly three years in the trenches mucking through their own very private experiences–both joyous and sobering–in order to put this album together. The Carpenter certainly maintains a common theme we have seen from the Avetts over the past decade–man searching for meaning through the passing seasons. The opening track, Once and Future Carpenter, stays true to this theme as it portrays the travels of “a poet young and hungry” on the eternal path for purpose. Imagery of spinning slot machines accompanied by lyrics like “sometimes I hit/sometimes it robs me blind” remind listeners that while life’s just one big crap shoot, we have to take risks and make the best of the hand we are dealt. Although Live and Die is the only banjo-heavy song on the album, I predict some disappointment from fans who covet that gritty punk-bluegrass Avett sound of past albums and live shows. Instead, Live and Die delivers a much more radio-friendly pop sound, and showcases a delicate and happy side of the banjo. 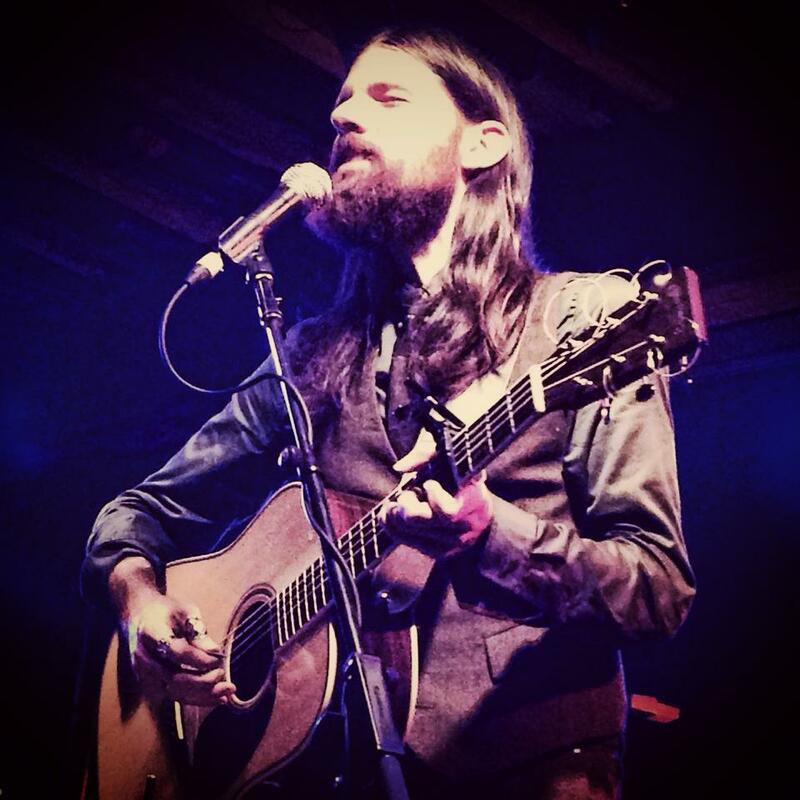 This catchy tune is like a big ol’ mason jar full of NC honey, dripping with the sweetness that is Mr. Seth Avett. It doesn’t get any sweeter than this folks. It is a fun and joyful song that I will undoubtedly be singing in and around the house for weeks to come. Winter in my Heart takes a somber turn as the band openly shares their woes with depression. A poignant admission of falling victim to the black veil of depression, this song will hit home for fans who have experienced their own feelings of hopelessness and despair. The brightest light in this dark song is Kwon’s hauntingly beautiful performance on the cello, which is further elevated by the eery cries of the musical saw (side note: whoever came up with the idea to use the musical saw on an album titled The Carpenter deserves his own Grammy. Seriously, that is genius!). 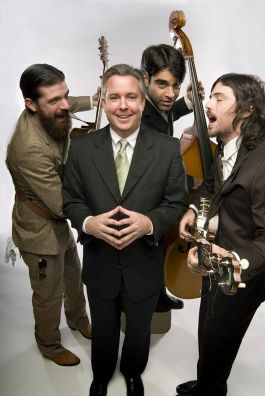 Overall, Kwon adds breathtaking dimension to this already multifaceted cast of characters, and continues to solidify the authenticity and uniqueness of The Avett Brothers. On a rejuvenated February Seven Avett country charm resurfaces with crisp guitar picking and clean vocals. This song feels like throwback Avett–a simple song with strong and honest lyrics, much like the songs of the musical legends that paved the way for them. Through My Prayers speaks to the heavy regret and sorrow that comes with missing the chance to tell someone you care. Here, Seth shares the story of a painful lesson learned and implores others to show the love in their hearts before it’s too late–no message could be more chilling and appropriate as this on the 11th anniversary of 9-11. The Avetts take a brief departure from their traditional acoustic sound, and give a slight nod to their Nemo and Oh What a Nightmare roots by bringing out the electric guitar for a few face-melting riffs on songs like Geraldine and Paul Newman vs. The Demons. Paul Newman vs. The Demons offers a new twist on an old theme–not learning from past mistakes (think Distraction #74)–but this time with a very different sound that tends to distract from the album’s cadence. On a positive note, the song does evoke quite vivid Labyrinth-esque images of Seth falling down a dark rabbit hole while being grabbed at by his demons on the way down, only to find Paul Newman there to save him in the end. Seriously, in my mind this has already translated into the most amazing Crackerfarm video. Nevertheless, it will be interesting and exciting to see how this song matures and holds up on stage. Additionally, Pretty Girl from Michigan gets plugged in and ends up as one of the best songs on the album. This song has been a longstanding fan-favorite, so it is nice to see such a smooth transition from the road to the studio. The infamous banjo returns on Down With The Shine, alongside a horns section that brings in some dirty Bourbon Street undertones. Although this song has been floating around for a few years, it made its first “national” debut on NPR’s Tiny Desk Concerts and has been evolving ever since. More recently the live version has turned into something of a big top waltz with Scott acting as the dramatic ring leader. While this album version is masterfully layered with rich instrumentation, it unfortunately feels bogged down and sluggish in comparison to the live version. Herein lies the magic that is the ever-changing nature of Avett Brothers songs, and also why I don’t put too much stock into the initial “feel” of the album versions of their songs. Inevitably, the live variations of these songs will continue to move audiences and strengthen their already loyal fan base. Fear not weary, doubtful fans, it will be alright. Deep beneath the mountains of depression, loss, and turbulence that drives the album, emerges a true gem that immediately beams with light. A Father’s First Spring shines brightly in all its glory as Scott shares the overwhelming feelings that accompanied the birth of his first child, Eleanor. To say that this song will move you to tears is an understatement (think Murder in the City, Part 2). Though simple, the lyrics “I was a child before/the day that I met Eleanor” reveal a complex evolution of character. Scott’s mastery of song and story allows him to speak on life’s purest love–that of a parent for his child–and evoke the deepest of emotions, even in listeners who have yet to experience parenthood. This track is a pure nugget of gold–a special gift from a proud daddy to his daughter, all in the name of posterity (of course). The album closes with Life, which highlights the fragility of our time here on Earth. Themes of faith and love are intricately woven through the song in true Avett fashion. The beauty of this song lies in its simple message to live with intention and keep those you love close, for “we’re not of this world for long”. As the end of the musical journey approaches, Life leaves me with a feeling of hope, promise, and empowerment. Overall, The Carpenter proves to be a cohesive collection of songs that gives fans a glimpse into the maturing hearts and minds of men who strive to find deeper meaning and purpose in life. The album succeeds in balancing themes of life and death–good and evil–and opens the door to further discovery and evolution. What it may lack in raw energy, it certainly makes up for with raw emotion, like a wound left open for all the world to see. This album bears the souls of a band of brothers who have been up against some very serious life changing events, yet in their transparency fans are afforded the opportunity to listen, relate, heal, and push on to a new day. The Carpenter, which was officially released today, is available on iTunes and exclusively at Target with bonus tracks* (*Standing With You and Die Then Grow are wonderful additions to the album, and will ease some of the longing for that old Avett sound). With the introduction of websites like PledgeMusic, musicians now have a way to help cover the costs of making an album. The process is easy–fans pledge a certain amount of money to help fund the album in exchange for some type of band memorabilia or experience. This new music business model directly incorporates the fan into the album making process, thus spawning a symbiotic relationship between musician and fan. Last year, Langhorne Slim and The Law decided to turn to their fans for help with their next project. This move seemed more than appropriate for a band that has been known to break into jam sessions after shows and who’s lead singer often invites fans on stage while he performs. Slim and The Law have been making direct connections with their fans for years, so when the fans were given the opportunity to pay it back with the PledgeMusic campaign, they didn’t shy away. 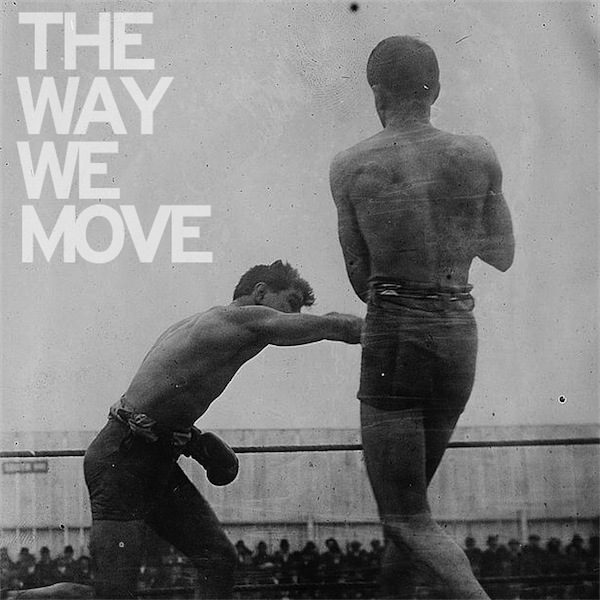 Over 450 fan pledges were made and the guys responded kindly with a brilliant new album, The Way We Move, which will be officially released by Ramseur Records on June 5th. The overwhelming fan response through PledgeMusic exceeded the band’s original goal by over 50%–a striking testament to the quality of their craft and character. Interestingly, I’ve discovered that Slim’s music doesn’t always ‘hook’ the listener until he/she sees him perform live, which is where he shines the brightest. Whether on stage solo or with his band, Slim is able to use his powerful bluesy rasp and jovial, heartfelt lyrics to project straight into your soul with ease. However, on his previous EPs and albums, this quality was somewhat lost in translation. Fortunately, all 14-tracks on The Way We Move capture Slim and The Law’s live spirit and energy better than any other previous studio recordings. This is the album you should play for the non-believers who just can’t seem to get on board the Langhorne Slim Express. The upbeat, joyful title track alone is enough reason to pick up the album in its entirety. Just try to play that song and sit still. Impossible. In between raucous tracks, Slim finds moments on the album to slows things down. Among the slower tracks, Salvation evokes the fear of moving on with lyrics like I want to hold you but my hands are cold/I meant to catch you but I moved too slow/I hate to leave, but it’s time to go, while Coffee Cups chronicles the emotions that come with life on the road. Well known as a hopeful romantic, Slim reveals his doubts and desires in love on several tracks including On the Attack and Someday. Slim’s band–The Law–provides a menagerie of beautiful supporting sounds including banjo/keys (David Moore), drums (Malachi DeLorenzo), and upright bass (Jeff Ratner), as well as back-up vocals/yells on tracks like Found my Heart and Two Crooked Hearts. The album closes with Past Lives, a crowd favorite at live shows that often involves Slim walking out into the audience to rub sweaty shoulders with his biggest supporters. Perhaps this was the band’s way of ending the album with a big “Thank You” to all of the folks who helped turn a dream into a reality. It couldn’t have happened to a nicer band. Nothing beats a live Langhorne Slim and The Law show, so check out their website for tour dates, and pre-order their new album, too.